Our work as Planners and Facilitators helps people to create the life they want in the community. This usually means that people take on a more active life outside of their family home – working, volunteering, visiting friends, and living independently. For many parents and caregivers, supporting your child, relative, or friend to build this life can bring up complex feelings. It can be exciting and thrilling, and at the same time challenging and stressful. Will they be okay taking the bus or living on their own? How do I know they are safe and that people are treating them well? What will I do with my time? 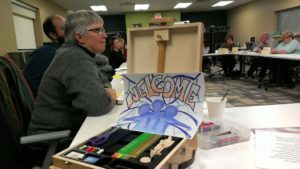 Bridges to Belonging, in partnership with Waterloo Region Family Network, hosts a Peer-Led Parent/Caregiver Support Group called A New Chapter: Families Moving Forward, where we can share some of the challenges – and solutions – in supporting someone to build a full and active life in the community. The next A New Chapter group runs on Wednesdays from March 21 to May 2. For more information and to register, you can email Wendy Newbery at wnewbery@bridgestobelonging.ca , and click here to download the poster. This program is supported financially by The Marianne and Jim Erb Family Fund, The Landmann Family Fund, The George Cluthe Fund, and The School Sisters of Notre Dame Legacy Fund as part of the Kitchener and Waterloo Community Foundation’s Sector Specific granting. Our thanks for the generous financial support. This program is also funded through our general fundraising activities. If you would like to donate towards this or other programs, please click here.